Doe Cross learned both Japanese and Western papermarking processes, experimenting and combining them into her own distinctive style. The handmade paper combined with wood, paint, pearls, stones, found objects, and text compose a story of human culture and the environment in delicate balance. The jewelry is light in weight, see suggested care information below. 2-3/8 inches long including goldfill earwire, 1 inch across the pair of natural twigs. Gold wire wraps around the twigs with a white pearl, and holds the elongated handmade paper shield that is colored metallic steel in the back, another shield mounted by wire and bead rivets on top that is marbled in silver, copper and gold. Lightweight. 2-1/8 inches long including goldfill earwire, 1-1/8 inch across the paper shape. Handmade paper semi-circle is colored in pearl with golden marbling. 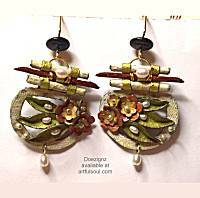 A trio of flowers and leaves are folded in relief on top, colored coral, green and ochre with tiny white pearl accents. This is suspended by golden paper straps to a pair of scrolls and single natural twig, gold wire and white pearl. Lightweight. 2 inches long including goldfill earwire, 7/8 inch across. Handmade paper shield is colored coral orange/red with golden stripe accent and the beaded center rivet. Suspended from a pair of natural twigs by golden wire, a white pearl and tube bead of natural carnelian stone complete the design. Lightweight. 2 inches long including goldfill earwire, 1 inch across twig. A pair of leaf-shaped and folded handmade paper pieces gracefully capture two white pearls within them. Colored marbled ivory, pearl, gold, suspended from natural twig by gold wire. Super lightweight. 2-3/8 inches long, 7/8 inch across twig. 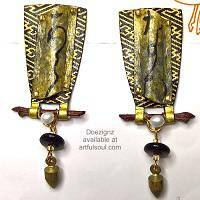 Earrings have background shield of handmade paper colored in black and gold pattern. Another piece of paper drapes across the top for full dimension, secured by beaded rivets at each corner, a subtle calligraphy motif in black and gold on that. Golden straps hold a natural twig below with white pearl, bead and charm swinging to finish Surgical post about 1/4 inch below top edge. Super lightweight. 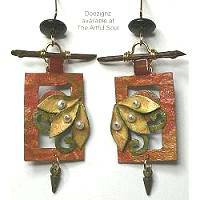 2-5/8 inches long including goldfill earwire, the handmade paper is 3/4 inch across. Ultra lightweight. Rectangle with upper window, window has delicate wire crossing it, colored in patina green with gold. Brass charm and black bead below, white pearl secured with wire along natural twig that holds the golden paper straps. 2-1/8 inches long including goldfill earwire, 1 inches across twig. Handmade paper wreath shape is colored marbled plum, with swirls and flower accents in lighter orchid, dotted by tiny white pearls. Suspended from natural twig by golden wire. 2-3/8 inches long including goldfill earwire, 3/4 inches across. A circle of handmade paper is cut like a pie slice and curled around a vertical natural twig. The paper is colored marbled coral orange and gold. White pearls are caught in golden wire with the paper and twig, dangling gold bugle beads extend from the cut opening. 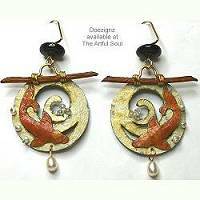 2-1/4 inches long including goldfill earwire, the handmade paper circle is 7/8 inch across. Painted in pear green color with terracotta, gray and golden streaks. Tiny white glass pearls dot the edge, and antoher pearl with peridot dangles freely. Suspended by golden wire from natural twig. 2-3/8 inches long including goldfill earwire, 1 inches across including natural twig. A rectangular frame, folded leaves, and background swirls all formed from handmade paper, and colored in marbled fall colors of red/orange, ochre and green. Suspended by golden wire and carnelian bead from natural twig, tiny pearl and brass charm accents. The paper is finished with a sealant and an acrylic medium, giving the piece durability and a unique look. It is not recommended the pieces become wet, but if they do, allow them to dry completely to return to their original sheen and shape. Read about what others think of Doezignz jewelry! Instead of reviews for a specific product, this is a place to share about the designer line in general.